Dritte Auflage3rd edition: xii+468, 2009. Vierte Auflage4th edition: xii+498, 2011. Fünfte Auflage5th edition: xiv+504, 2013. Sechste Auflage6th edition: xiv+508, 2015. Siebte Auflage7th edition: xiv+514, 2017. Achte Auflage8th edition: xiv+ca.520, 2020. Vierte Auflage4th edition: viii+241, 2009. Fünfte Auflage5th edition: viii+243, 2014. Sechste Auflage6th edition: viii+249, 2015. Dritte Auflage3rd edition: x+308, 2008. Vierte Auflage4th edition: x+316, 2010. Fünfte Auflage5th edition: x+318, 2014. Sechste Auflage6th edition: x+342, 2016. Siebte Auflage7th edition: x+346, 2018. Achte Auflage8th edition: x+346, 2019. Benjamin Albrecht, Volker Heun, Space Efficient Modifications to Structator - a Fast Index-Based Search Tool for RNA Sequence-Structure Patterns, Proceedings of the 11th International Symposium on Experimental Algorithms (SEA 2012) (Ralf Klasing, ed. ), Springer Verlag, vol. 7276, Bordeaux, France, June 7-9, 2012, pp. 27-38, 2012. Johannes Fischer, Volker Heun, Space-Efficient Preprocessing Schemes for Range Minimum Queries on Static Arrays, SIAM Journal on Computing, vol. 40, no. 2, pp. 465-492, 2011. Johannes Fischer, Volker Heun, Finding Range Minima in the Middle: Approximations and Applications, Mathematics in Computer Science, vol. 3, no. 1, pp. 17-30, 2010. Johannes Fischer, Volker Heun, Range Median of Minima Queries, Super-Cartesian Trees, and Text Indexing, Proceedings of the International Workshop on Combinatorial Algorithms (IWOCA’08) (Mirka Miller, Koichi Wada, eds. ), College Publications, vol. 12, September 13-15, 2008, Nagoya, Japan, pp. 239-252, 2010. Simon W. Ginzinger, Marko Skocibusic, Volker Heun, CheckShift Improved: Fast Chemical Shift Reference Correction with High Accuracy, Journal of Biomolecular NMR, vol. 44, no. 4, pp. 207-211, 2009. Volker Heun, Analysis of a Modification of Gusfield’s Recursive Algorithm for Reconstructing Ultrametric Trees, Information Processing Letters, vol. 108, no. 4, pp. 222-225, 2008. Johannes Fischer, Volker Heun, Horst Martin Stühler, Practical Entropy-Bounded Schemes for O(1)-Range Minimum Queries, Proceedings of the 2008 Data Compression Conference (DCC’08) (J.A. Storer, M.W. Marcellin, eds. ), IEEE Computer Society, Snowbird, Utah, U.S.A., March 25-27, 2008, pp. 272-281, 2008. Johannes Fischer, Volker Heun, Range Median of Minima Queries, Super-Cartesian Trees, and Text Indexing, Local Proceedings of the 19th International Workshop on Combinatorial Algorithms (IWOCA’08) (Mirka Miller, Koichi Wada, eds. ), Nagoya, Japan, September 13-15, 2008, pp. 239-252, 2008. Simon W. Ginzinger, Fabian Gerick, Murray Coles, Volker Heun, CheckShift: Automatic Correction of Inconsistent Chemical Shift Referencing, Journal of Biomolecular NMR, vol. 39, no. 3, pp. 223-227, 2007. Simon W. Ginzinger, Volker Heun, SimShiftDB: Chemical-Shift-Based Homology Modeling, 15th Annual International Conference on Intelligent Systems for Molecular Biology (ISMB) and 6th European Conference on Computational Biology (ECCB), Vienna, Austria., 2007. Simon W. Ginzinger, Thomas Gräupl, Volker Heun, SimShiftDB: Chemical-Shift-Based Homology Modeling, Proceedings of the First International Conference on Bioinformatics Research and Development (BIRD’07) (Sepp Hochreiter, Roland Wagner, eds. ), Springer, vol. 4414, Berlin, Germany, March 12-14, pp. 357-370, 2007. Johannes Fischer, Volker Heun, A New Succinct Representation of RMQ-Information and Improvements in the Enhanced Suffix Array, Proceedings of the International Symposium on Combinatorics, Algorithms, Probabilistic and Experimental Methodologies (ESCAPE’07) (Bo Chen, Mike Paterson, Guochuan Zhang, eds. ), Springer-Verlag, vol. 4614, Hangzhou, China, April 7-9, 2007, pp. 459-470, 2007. Johannes Fischer, Volker Heun, Stefan Kramer, Optimal String Mining Under Frequency Constraints, Proceedings of the 10th European Conference on Principles and Practice of Knowledge Discovery in Databases (PKDD’06) (J. Fürnkranz, T. Scheffer, M. Spiliopoulou, eds. ), Springer-Verlag, vol. 4213, Berlin, Germany, September 18-22, 2006, pp. 139-150, 2006. Johannes Fischer, Volker Heun, Theoretical and Practical Improvements on the RMQ-Problem with Applications to LCA and LCE, Proceedings of the 16th Annual Symposium on Combinatorial Pattern Matching (CPM’06) (Moshe Lewenstein, Gabriel Valiente, eds. ), Springer-Verlag, vol. 4009, Barcelona, Spain, July 5-7, 2006, pp. 36-48, 2006. Johannes Fischer, Volker Heun, Stefan Kramer, Fast Frequent String Mining Using Suffix Arrays, TUM-I0512, Institut für Informatik der Technischen Universität München, no. TUM-I0512, 2005. Johannes Fischer, Volker Heun, Stefan Kramer, Fast Frequent String Mining Using Suffix Arrays, Proceedings of the 5th IEEE International Conference on Data Mining (ICDM’05), IEEE Computer Society, Houston, TX, USA, November 27-30, 2005, pp. 609-612, 2005. Volker Heun, Approximate Protein Folding in the HP Side Chain Model on Extended Cubic Lattices, Computational Molecular Biology (S. Istrail, P. Pevzner, R. Shamir, eds. ), North Holland, vol. 12, 2003. Volker Heun, Approximate Protein Folding in the HP Side Chain Model on Extended Cubic Lattices, Discrete Applied Mathematics, vol. 127, no. 1, pp. 163-177, 2003. Volker Heun, Grundlegende Algorithmen - Einführung in den Entwurf und die Analyse effizienter Algorithmen, Vieweg Verlag, 2003. Werner Mewes, Dmitrij Frishman, Volker Heun, Stefan Kramer, Proceedings of the German Conference on Bioinformatics, GCB 2003 (Neuherberg and Garching, Germany, October 12-14, 2003), belleville Verlag München, 2003. Volker Heun, Ernst W. Mayr, Efficient Embeddings into Hypercube-Like Topologies, The Computer Journal, vol. 46, no. 6, pp. 632–644, 2003. Volker Heun, Ernst W. Mayr, Efficient Dynamic Embeddings of Arbitrary Binary Trees into Hypercubes, Journal of Algorithms, vol. 43, no. 1, pp. 51–84, 2002. Volker Heun, Ernst W. Mayr, Embedding Graphs with Bounded Treewidth into Optimal Hypercubes, Journal of Algorithms, vol. 43, no. 1, pp. 17–50, 2002. Jens Ernst, Volker Heun, Ulrich Voll, Generalized Clustering of Gene Expression Profiles — A Spectral Approach, Proceedings of the International Conference of Bioinformatics (INCOB’02), Bangkok, Thailand, February 06–08, 2002, 2002. Volker Heun, Ernst W. Mayr, Optimal Dynamic Embeddings of Complete Binary Trees into Hypercubes, Journal of Parallel and Distributed Computing, vol. 61, no. 8, pp. 1110–1125, 2001. 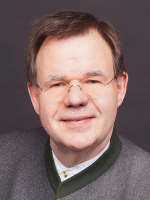 Volker Heun, Grundlegende Algorithmen — Einführung in den Entwurf und die Analyse effizienter Algorithmen, Vieweg Verlag, 2000. Volker Heun, Approximate Protein Folding in the HP Side Chain Model on Extended Cubic Lattices, Proceedings of the 7th Annual European Symposium on Algorithms (ESA’99) (Jaroslav Nesetril, ed. ), Springer-Verlag, vol. 1643, Prague, Czech Republic, July 16–18, 1999, pp. 212–223, 1999. Volker Heun, Approximate Protein Folding in the HP Side Chain Model on Extended Cubic Lattices, ICSI-TR-98-029, International Computer Science Institute, Berkeley, CA, no. ICSI-TR-98-029, 1998. Volker Heun, Ernst W. Mayr, Optimal Dynamic Embeddings of Complete Binary Trees into Hypercubes, ICSI-TR-98-022, International Computer Science Institute, Berkeley, CA, no. ICSI-TR-98-022, 1998. Volker Heun, Ernst W. Mayr, Efficient Dynamic Embeddings of Arbitrary Binary Trees into Hypercubes, ICSI-TR-98-023, International Computer Science Institute, Berkeley, CA, no. ICSI-TR-98-023, 1998. Volker Heun, Wolfgang Merkle, Ulrich Weigand, Proving the PCP-Theorem, Lectures on Proof Verification and Approximation Algorithms (Ernst W. Mayr, Angelika Stager, Hans Jürgen Prömel, eds. ), Springer-Verlag, vol. 1367, pp. 83–160, 1998. Volker Heun, Effiziente Einbettungen baumartiger Graphen in den Hyperwürfel, Ausgezeichnete Informatikdissertationen 1996 / im Auftrag der Gesellschaft für Informatik e.V. herausgegeben durch den Nominierungsausschuß (W. Bibel, H. Fiedler, W. Grass, P. Gorny, G. Hotz, I. Kerner, R. Reischuk, F. Roithmayr, eds. ), Teubner-Verlag, pp. 29–45, 1998. Volker Heun, Ernst W. Mayr, Optimal Dynamic Edge-Disjoint Embeddings of Complete Binary Trees into Hypercubes, Proceedings of the 4th International Workshop on Parallel Systems and Algorithms (PASA’96) (Friedel Hoßfeld, Erik Maehle, Ernst W. Mayr, eds. ), World Scientific Publishing, Jülich, Germany, April 10–12, 1996, pp. 195–209, 1997. Volker Heun, Ernst W. Mayr, Optimal Dynamic Edge-Disjoint Embeddings of Complete Binary Trees into Hypercubes, TUM-I9607, Institut für Informatik der Technischen Universität München, no. TUM-I9607, 1996. Volker Heun, Ernst W. Mayr, Efficient Dynamic Embeddings of Arbitrary Binary Trees into Hypercubes, Proceedings of the 3rd International Workshop on Parallel Algorithms for Irregularly Structured Problems (IRREGULAR’96) (Afonso Ferreira, José D. P. Rolim, Yousef Saad, Tao Yang, eds. ), Springer-Verlag, vol. 1117, Santa Barbara, CA, USA, August 19–21, 1996, pp. 287–298, 1996. Volker Heun, Ernst W. Mayr, A New Efficient Algorithm for Embedding an Arbitrary Binary Tree into Its Optimal Hypercube, Journal of Algorithms, vol. 20, no. 2, pp. 375–399, 1996. Volker Heun, Ernst W. Mayr, Embedding Graphs with Bounded Treewidth into Optimal Hypercubes, Proceedings of the 13th Annual Symposium on Theoretical Aspects of Computer Science (STACS’96) (Ernst W. Mayr, Claude Puech, eds. ), Springer-Verlag, vol. 1046, Grenoble, France, February 22–24, 1996, pp. 157–168, 1996. Volker Heun, Efficient Embeddings of Treelike Graphs into Hypercubes, Shaker-Verlag, Aachen, 1996. Volker Heun, Ernst W. Mayr, Embedding Graphs with Bounded Treewidth into Optimal Hypercubes, TUM-I9539, Institut für Informatik der Technischen Universität München, no. TUM-I9539, 1995. Volker Heun, Ernst W. Mayr, A New Efficient Algorithm for Embedding an Arbitrary Binary Tree into Its Optimal Hypercube, TUM-I9321, Institut für Informatik der TU München, no. TUM-I9321, 1993. Volker Heun, Ernst W. Mayr, A New Efficient Algorithm for Embedding an Arbitrary Binary Tree into Its Optimal Hypercube, Proceedings of the 3rd Workshop on Parallel Systems and Algorithms (PASA’93), Gesellschaft für Informatik e.V., vol. 11, Bonn, Germany, April 1–2, 1993, pp. 7–11, 1993. Benjamin Albrecht, Computing Hybridization Networks Using Agreement Forests, PhD Thesis, Ludwig-Maximilians-Universität München, 2016. Luca Chiarabini, Program Development by Proof Transformation, PhD Thesis, LMU München, 2009. Simon W. Ginzinger, Bioinformatics Methods for NMR Chemical Shift Data, PhD Thesis, LMU München, 2008. Johannes Fischer, Data Structures for Efficient String Algorithms, PhD Thesis, LMU München, 2007.